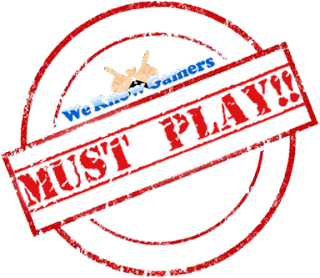 Like collecting items, making new outfits and discovering new powers, all while you can team up with two other friends? 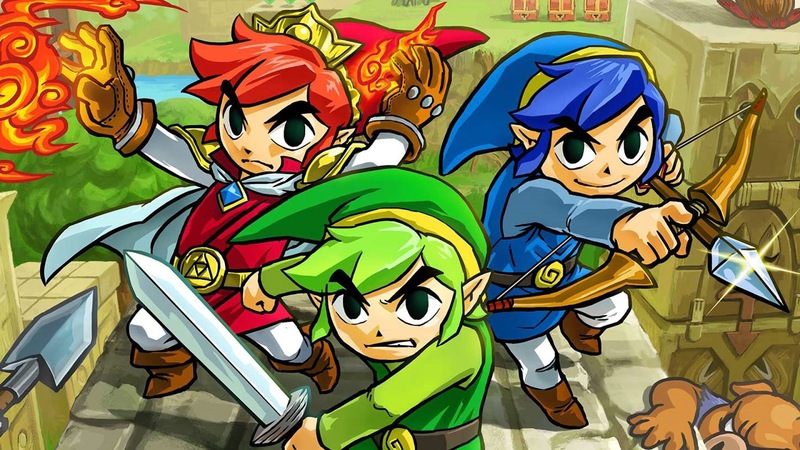 Well then Triforce Heroes is definitely for you as Nintendo look to expand on the multiplayer aspect of the Zelda series. For most people, we see the Zelda games as a single player experience. A lone hero, travels the land of Hyrule to save the princess from the big bad who's threatening to take over the world, but it looks like in these iterations, you can have you buddies help you out on that quest. Now this has to be one of the weirdest plots for not just a zelda game, but pretty much any game in general. Triforce Heroes takes place several years after A Link Between Worlds where we are presented with Hytopia, a kingdom whose people are obsessed with fashion... yes you read that right. So what's our hero doing here? Well Styla, who is the princess of Hytopia is cursed by The Lady who forces her to wear an ugly black jumpsuit which she can't take off, the result? Her father King Tuft sends out a call to kingdoms near and far for a hero to save the day. Link who just happened to be passing through, saw one of the signs for help which mentions a legend about the Totem Heroes and a reward. After being spotted by Madam Couture's assistant and matching the legendary heroes features, Link is tasked with saving the kingdom. Now its one thing having Hyrule dragged in to darkness and evil for all eternity, but its another where the hero has to put himself through excessive danger just so the princess can remove an ugly jump suit... seriously? Now I know the plot is not exactly the masterpiece kind, but the rest of the game more than makes up for it in its gameplay which actually makes sense later on. As mentioned earlier, this is a cooperative game which has Link accompanied by two dopplegangers which you can switch between in the single player or two friends in the multiplayer. In total there are 32 levels which are split up into 4 areas and the main goal is to work together to defeat the enemies and solve the puzzles. At the end of each area there is a boss to defeat and upon completion, you unlock the next part. 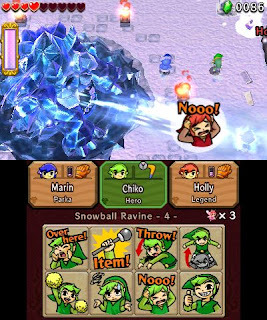 While this would seem pretty standard, Triforce heroes expands on this through the use of costumes which plays on the whole, Hytopia is all about fashion setting. The costumes are made by a specialist called Madame Couture, who runs a shop. In order for a costume to be made, materials need to be collected and these can be found at the end of each area after defeating the boss. The more you explore the game, the more costumes that will be available. Each costume comes with its own perks that can help you depending on what level you are tackling. 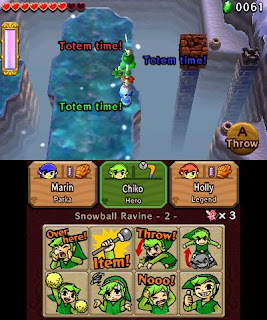 For example, the Kokiri outfit lets you shoot out three arrows at once or the Bomb outfit which allows you to throw out extra large bombs to deal more damage. It just lets you plan ahead a little as before each level starts, it displays what items will be available to you allowing you to pick the right outfit, but beyond its powered up capabilities, its nice to see that it also gives each link a unique look. Earlier on I was blasting through the levels, but do not fear as Nintendo do make things more challenging later on. It gets to a point where you expect something to happen and then a whole new pitch is thrown at you, whether its the amount of enemies that are attacking you on screen at once or the way a puzzle needs to be completed. Another aspect that is greatly emphasised is the Totem the legend speaks of. This is incorporated really well during the game and is used in almost everything, but most amazingly its used the best when it comes to fighting a boss as sometimes you need to go up a level or two in order to land an attack. Its great that nothing is really wasted here or thrown in for a laugh, but instead brings meaning to the gameplay. 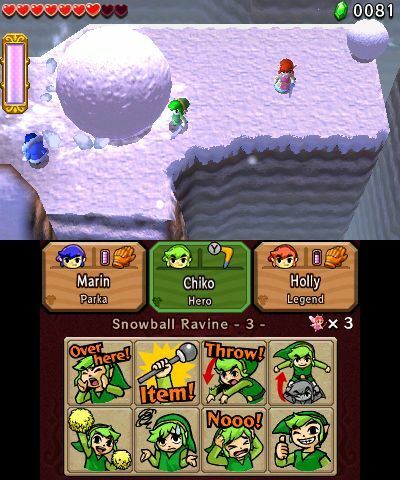 Even the levels themselves are designed in such a way that it compliments the 3D aspect of the handheld. I remember one of the levels which included riding a rail cart which had several levels to it, making the 3D look amazing. I didn't get a chance to test out its online capabilities and I didn't have much trouble communicating with my team mates because we were all in the same room, however I do find it odd that Nintendo decided to not add voice chat, especially if you are playing with a complete stranger. The voice icons do work to an extent, but if you are looking to plan ahead or discuss ideas on how to complete a puzzle, there is no way to do it. Hopefully this is something they'll add later on. Other little goodies include a small minigame that you can play before entering the Drablands which is essentially a small ball which you keep up in the air for as long as you can, which in turn plays a popular tune from the franchise. An example use of the icons. If there is one thing I've noticed, its that once you've quested with a bunch of mates, going back to single player is the worst thing ever. It made me think about why they ever even bother including a single player aspect to begin with. Playing with others definitely took me back to the couch multiplayer days before all this online business took over and this I truly believe is the game's highest selling point. The Legend of Zelda: Triforce Heroes is an amazing game when you are playing with mates as the single player just can't replicate that feeling. The levels look great and puzzles can become really challenging. I think Nintendo really has something here when it comes to multiplayer and Zelda, but as this moment in time, it seems like they only believe it'll work well on the smaller screen.